On Monday January 21, the day after UCA College Nationals, USA Cheer hosted tryouts for their 2019 Coed and All Girl competition teams. With the top collegiate talent in the country vying for one of 33 spots including alternates for the Coed team, and one of 36 spots including alternates for the All Girl team, the tryout process was tough. 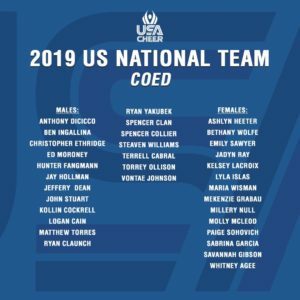 The selected team members will travel to the Team USA training center in April to begin training for the ICU World Cheerleading Championship, held April 24-26 at Disney’s Wide World of Sports. 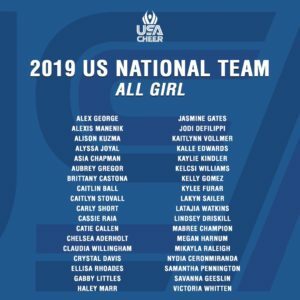 Congratulations to the members of Team USA All Girl and Coed 2019!